I was listening to The Survivalist Podcast a couple weeks ago while driving to work, and the featured guest was a well-spoken survivalist gentleman by the name of Tim Ralston (inventor of the “Timahawk” survival tool), and he was discussing bug-out gear. When the conversation turned to flashlights and illumination, Mr. Ralston verbally swooned over a flashlight product by a company called HybridLight. The product he’d mentioned was the Journey 250, and the description and testimonial was compelling enough for me to track down the company and see what they were all about. So I looked ‘em up and shot ‘em an email. While performing the initial research on the Journey 250, I quickly found my way to HybridLight’s website and started scanning. The “About” link filled me in on the basics: HybridLight offers solar-powered illumination (yes, you read that right) products across a variety of platforms. That’s the basis of the product design – but there’s more to it than just a flashlight with a solar panel. HybridLight goes one step further: the majority of their products boast standard USB ports to act as charging stations for your cellphone, tablet, MP3 player, GPS, you name it. If your electronic gadget utilizes a USB cable to charge, chances are a HybridLight will play nice with it. The company found its roots in 2006 when Terry Peterson started toying with solar-powered technology. Solar panels were becoming smaller, more dependable, and able to be used in a multitude of applications. Terry has since developed hybrid solar power into an immensely useful tool – not just to capture and store solar energy, but tailor it to be used to charge cellphones or tablets. All this works – extremely well. 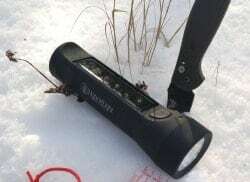 After some jovial communications with the incredibly nice HybridLight team, they sent me a Journey 160 model flashlight to use, abuse, and evaluate. The Journey 160 flashlight is a tidy little number, 6 inches in length. 1.75” wide across the lens bezel, and 4.5 ounces. 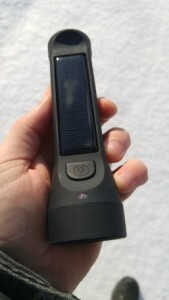 The handle profile features a solar panel, about 1” wide by 4” long, inset into the polymer casing. The only control on the Journey 160 is a single rubber push-button mounted just ahead of the solar panel. This button tells the enclosed 2,400 mAh lithium-ion to send power to the LED bulb in low or high intensities, and features a strobe function if held for a moment. The bezel and lens are fixed; no Maglite-type focusing beam here. Nice and simple; simple things don’t break as easily. The Journey 160 blasts out 160 lumens of useful light at its highest setting. Under the waterproof O-ring sealed tail cap at the rear of the Journey 160, you’ll find two ports: one is a “power-in” Micro-USB port; the other is “power-out”, a standard USB dock. You can use a standard micro-USB cable to charge via a standard outlet-mounted wall charger (such as the one that comes with your smartphone – not included with the Journey 160. ); all you need to do is plug the Journey 160 in just as if you were charging your phone – just plug the Micro USB end of the cord right into the port on the flashlight. A red LED, mounted just forward of the power switch, will illuminate to show that you are charging the sealed battery. Once the battery is full, the LED turns green. To charge the Journey 160 via the integral solar panel, all you need to do is put the flashlight in direct sunlight with the panel towards the sun. Foolproof. The Journey will still charge if there is cloud cover, albeit at a much slower rate. Charging via USB from your home outlet is substantially faster than the solar method. 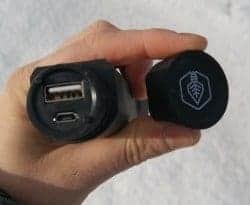 To use the HybridLight Journey 160 as a device charger, all you need to do is insert your standard USB cable into the larger port, and the other end to your device that needs a charge. The Journey 160 works with micro-USB, Older Apple cords as well as Apple Lightning chargers, mini-USB…you name it. It will charge Android as well as Apple devices with equal aplomb; but the included USB cable will not work on Apple products, so you’ll have to supply your own. As reported by HybridLight, the Journey 160 is waterproof to 1 meter and floats, and can withstand drops from one meter. One full charge will supply 25 hours of continuous light at the low brightness setting, and 8 hours at the brightest 160 lumen setting. The battery will, according to the manufacturer, hold a charge for years if not used. Website-issued specifications are all well and good, but how does an item such as this flashlight – a life-saving tool for sure – stand up when used and abused on a semi-daily basis? Well, I’ve been beating my specific Journey up for a couple months now, in all sorts of weather and varying conditions, and I’m happy to report my findings. My three-year-old son LOVES flashlights, so the very first thing I did after taking the Journey 160 out of the packaging was to turn it on and hand it over to him for his version of QC inspection. Over the course of the next twenty minutes, he subjected it to far more abuse than I usually punish my gear with over the course of a year. The flashlight got thrown across the room, ricocheted off a pellet stove, rolled over floors, bounced off end tables, dropped about a hundred times, rolled around on hardwood floors, crashed into by Hot Wheels cars, and, of course, found its way into the toilet after lil’ dude overheard me telling my wife the flashlight floats (it does). I took back ownership after the initial abuse testing, and there was nary a scratch or dent in the casing of the Journey 160, and the bezel lens was pristine. As a matter of fact, all photos shown in this review are of the flashlight AFTER it’s been used for quite some time, toddler torture included. I also did some testing of my own. I performed some waist-high drops onto our kitchen tile floor, including one gentle toss of about eight feet. The HybridLight bounced a couple times, and that was about it. Pretty anticlimactic; the Journey 160 earns high marks for ruggedness in my book. Honestly; most light sources ride in glove compartments, kitchen drawers, pockets, or packs until they are needed, so they can lead a pretty pampered life under normal use. Provided the Journey 160 doesn’t take a tumble off a cliff or get run over by a tracked vehicle, I’m confident it can withstand all ordinary, and some extraordinary abuse most users will subject it to. It can’t be used as a hammer or anything like that, but it’s quite sturdy for a moulded plastic casing that weighs 4.5 ounces. Oh yeah, the Journey 160 is a portable charging station as well as a splendid torch. The onboard 2,400mAh battery can be used to charge portable devices. 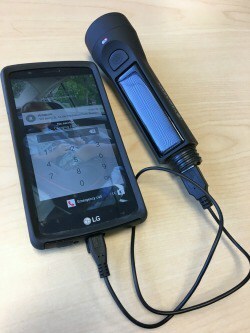 If one leaves the flashlight plugged into a device via USB cable and leaves the light in the direct sun, the solar panel will continuously charge the flashlight’s battery, which will then charge the device’s battery. However, solar power is not needed to charge devices – assuming a fully-charged battery, 80% of the 2,400 mAH battery is on tap to charge devices; the remaining 20% is always saved on reserve to allow the Journey 160 to soldier on for a time in its primary illuminating mission. Most modern large-screen smartphones have batteries in the 2,500-3,000 mAH range; an iPhone 6S has a 2,750 mAH battery, and an LG G4 and Samsung Galaxy S7 both boast 3,000 mAH batteries, so the Journey 160 won’t provide a complete battery charge in one sitting for most cellphones – but it’ll get you about halfway there. My personal LG G4 smartphone went from 12% to 64% before the Journey cut the power, with a charging time of probably 20 minutes – faster than expected. Charging via a wall-mounted charger takes an hour or so from a depleted battery to full. Charging the Journey to full charge via solar power alone takes a while – like 18-20 hours in direct sunlight. So, unless you’re in Alaska in July, you’re not going to get enough direct sunlight during the course of one day for a full battery charge. And if you’re counting on fully charging a smartphone and the flashlight in that period of time, you’ll probably be pretty disappointed. However, I was able to charge both of my Motorola MJ270R walkie-talkies in one day of bright sunshine – so results will vary based on equipment you use and ambient daylight levels. In the usefulness department, the Journey 160 is aces. Not too big and not too small, the flashlight fits in a hand beautifully, with the kinda-rubbery feeling polymer being contoured to provide adequate grip without being obtrusive (think an old 4 “D”-cell Maglight) I’ve been keeping the flashlight by my bedside for night duty, in my jacket pocket when I go outside or to work, and have just made a point to make sure that it is readily available for when I require illumination. While it’s a bit big for an EDC (every day carry) pocket flashlight, the Journey 160 is a wonderful size for general-purpose flashlight use, and it has supplanted my old similarly-sized rechargeable Streamlight Scion as my favorite go-to flashlight. The HybridLight Journey 160 is just a killer flashlight that throws a useful amount of illumination- and that’s even before you consider that you can charge devices from it. The price on one of these bad boys is lower than expected – just $34.95 via their website. And when I tell you you should run right out and get one, you should. Get two. Or Three. This is the best general-purpose flashlight I have in my house: it keeps a full charge, I never have to worry about the kids stealing the batteries to put in the TV remote control, and it can bounce around in the “miscellaneous stuff” drawer along with paperweights and your spare hammer and it’ll be ready when you need it. Same goes for the Journey 160 being a stellar Bug-Out-Bag light – it weighs almost nothing, is sturdy, and charges itself – emergency perfection. Really, the only improvement I could envision to this flashlight would be a lanyard loop with a tether attached to it, to keep one from losing the tailcap once it’s unscrewed – and so the user could affix a lanyard to the light and attached pack, belt, etc. Nobody likes losing their survival light in a survival situation. More Journey 160s – one for my truck box and one for my tacklebox – are on my Christmas list; I’m hoping Santa is nice to me this year. But seriously: go get a Journey 160. Right now. I am without doubt that you’ll positively love it. Questions? Got something that does the same thing but better? Sound off in the comments below!